It’s no surprise that the smartphone has become central in the connected consumer’s daily communications, utility, and entertainment experiences. Over the past year, and, in step with device, network and content/app ecosystem improvements, the connected consumer is spending even more time on their phone. 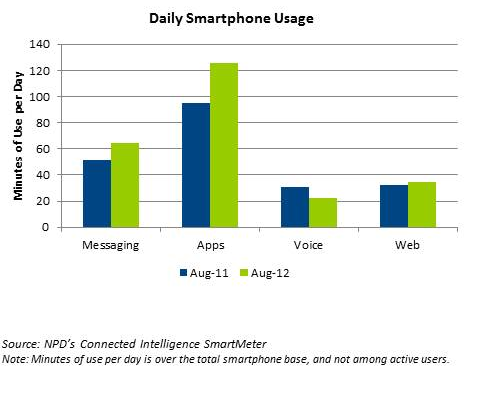 According to NPD’s Connected Intelligence SmartMeter when comparing monthly usage of minutes per day for August 2011 versus August 2012, Android smartphone users spent nearly one-fifth more time on their smartphones daily – 247 minutes, or over four hours versus 210 minutes or 3.5 hours. At a high-level, applications, messaging, and to a lesser extent web browsing usage, all contributed to the growth, whereas voice has clearly become far less dominant and central to the smartphone experience. Bottom line: over half of the smartphone users’ daily time is spent in apps; while communications (messaging and voice) comprises 35 percent; and web browsing less than 15 percent. So, what is driving applications usage? Well, interestingly it’s a lot of stuff, but not necessarily games – which while certainly still driving significant usage, was the only entertainment category that was flat. 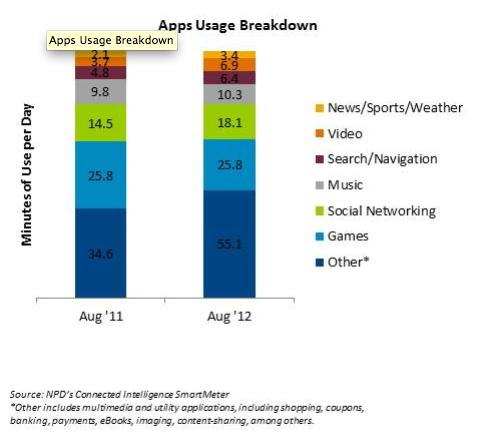 Gaming is a mature category, with reach trending down since March 2012, and consumers are clearly allocating more of their smartphone time to a myriad of other application experiences. While time spent on video is limited compared to other categories, it has been a significant contributor to data network traffic growth for the wireless carriers. Daily video usage was up 87 percent (from 4 to 7 minutes daily over the August 2011 and August 2012 period), and we expect usage to increase in step with 4G networks and devices, better form factors (larger screens), and more compelling apps. Consumers are also spending more time in news, sports, weather, search/navigation, social networking, and “other” application experiences. We are seeing growth in a number of those “other” applications including coupons, shopping, imaging, and eBooks, among others. Overall, the data is instructive (for service providers, device manufacturers, content owners, publishers, application developers, advertisers and others) to track how Android smartphone users are spending their time on their devices.